I have lived along the west Texas Rio Grande border on and off for many years. During this time I did a fair amount of research and writing about Big Bend border history and as a historian I cannot ignore the lessons of the past. Today Mexico is at war with itself. A massive tide of refugees is reportedly crossing our southern border. The U. S. Border Patrol is overwhelmed. The issue has become quite politicized as tempers flair with vehement demands to militarize our Rio Grande boundary. Shadowy militia groups with their own agendas have also entered the picture. Few seem to realize that none of this is particularly new. Striking similarities exist between this present day crisis and what took place on the border a century ago. In mid-1916 President Woodrow Wilson ordered the National Guards of Texas, New Mexico and Arizona, consisting of some 110,000 officers and men, to the southern border to prevent ongoing bandit raids and violence originating in Mexico. In the upper Big Bend of Texas a number of new cavalry outposts came into existence within a matter of months. For the next three years the U. S. Army, including members of the National Guard, the Texas Rangers as well as armed vigilantes took part in numerous deplorable punitive actions that destroyed the lives of hundreds of Mexicans living on both sides of the Rio Grande. Today it would be called collateral damage but that does not mitigate the inhumanity that resulted. The similarities between those times and today are striking. Perhaps the most serious of these reprisals took place just after midnight on January 27, 1918 when Troop G of the Eighth U.S. Cavalry, Texas Rangers of Company B from Marfa, Texas and a group of vigilantes surrounded the tiny Presidio County village of Porvenir. A little more than a month previous a group of Mexican raiders had attacked the west Presidio County Brite Ranch robbing a store and stealing a herd of cattle and horses as well as shooting up the place. The raid made national newspaper headlines and initiated calls to teach border Mexicans a lesson. The some 140 residents of Porvenir were dragged from their homes into the freezing night. A search of the village turned up little; no stolen goods, only one old gun with no cartridges and a few knives. The Rangers selected fifteen Porvenir men between the ages of 16 and 72 years and marched their prisoners off into the darkness. Some distance away, the fifteen were unceremoniously shot to death. A few days after the massacre, Troop G returned to Porvenir and destroyed the village. The U.S. Army successfully covered up its role in the killings. Five Texas Rangers were fired from their jobs but never faced prosecution. The actions of the U.S. Army, the Texas Rangers and vigilantes at Porvenir went well beyond the murders of fifteen poor tenant farmers. Forty-two children lost their fathers and their homes as a result of the atrocity. The tension and border raids did not end at Porvenir however. The border raids and brutal retaliations continued on for another year and a half only ending when the U. S. Army left the border entirely in the fall of 1919. More recently in May 1997, a member of U.S. Marine Joint Task Force 6 drug interdiction patrol shot and killed eighteen-year-old Esequiel Hernandez near the Rio Grande border as he herded goats near his family home outside Redford, Texas. Young Hernandez carried an antique single shot .22 rifle that day to fend off predators. According to the Marines, Esequiel fired a shot in their direction. He probably did not realize the Marines were nearby since they wore camouflaged “ghillie” suits. Acting on orders to return fire, Corporal Clemente Banuelos opened up killing the innocent goat herder. The Hernandez killing became a symbol of the failure of U.S. Drug policy. About that same time upriver from Redford, the Marines established a training outpost at Candelaria, Texas that operated for several summers. A U.S. Army camp about 30 miles upstream from Candelaria also went into operation. The build up of U.S. military prompted the Mexican government to move a contingent of several thousand troops from Chiapas to the border to counter the U.S. troops just across the river. For more than a year the Texas upper Big Bend once had again became an armed camp with soldiers from two nations separated only by a small stream of water known as the Rio Grande River. Citizens on both sides of the border were alarmed and things only quieted down when both the U.S. and Mexican forces left the area much to the relief of border residents. Texas Governor Rick Perry’s recent decision to order 1,000 national guardsmen to the Mexican border is an ill advised political move. At a cost of about $12 million dollars a month, the militarization will only increase border tensions as it always has in the past. These guardsmen have highly questionable arrest powers and lack training in law enforcement. Many of them cannot speak Spanish only adding to the difficulty. Let the Border Patrol and local law enforcement carry out their job, a job they are trained to do and give them the necessary support and funding needed. As Winston Churchill put it, “Those who fail to learn from history are doomed to repeat it”. 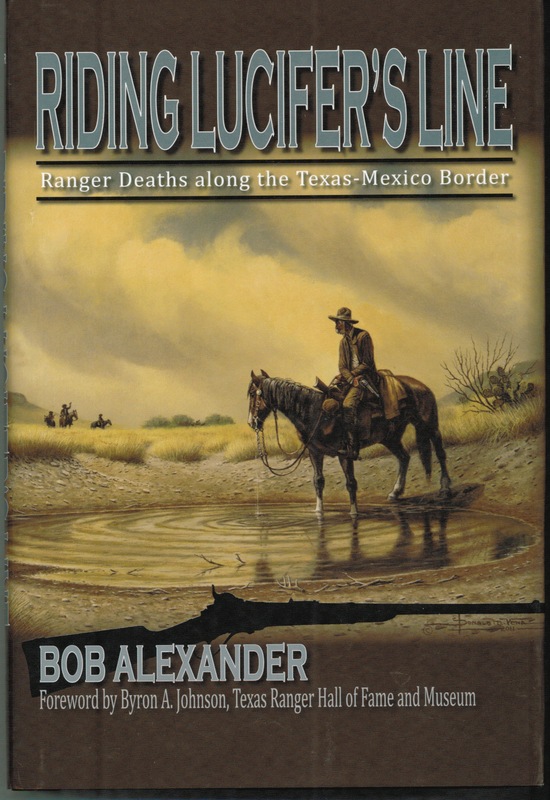 Bob Alexander’s "Riding Lucifer’s Line" is a well researched collection of twenty-five sketches about Texas Rangers who died by gunshot in the performance of their duties along the Texas-Mexican border between the years 1875-1921. Writing from the knowledgeable perspective of a retired U.S. Government Treasury officer, Alexander undertook a formidable task piecing together the often-obscure and many times incomplete life stories of these selected lawmen. This is not an easy task. Historical records relating to Texas Rangers are frequently spotty and incomplete for a variety of reasons. Some were lost to fire or other calamity while others curiously somehow vanished from state archives, county courthouses and other repositories. These Rangers commonly moved from job to job inside and outside law enforcement seldom staying in one location or position for long periods. Pay was low, hardship plentiful and life threatening danger a constant factor. Alexander’s Rangers met death in a variety of ways ranging from accident to ambush with a surprising number being the result of inexperience and the absence of modern tactical training. Early day Rangers had to learn law enforcement mostly by performing the job and sometimes this in itself proved deadly particularly on the Texas-Mexican border. An example of this was the 1890 death of Texas Ranger Private John H. Gravis in Presidio County. Gravis had been a Ranger for about five months when he and a deputy sheriff got into a gunfight in the rowdy silver mining town of Shafter. The young Ranger lost his life after being shot in the head. While conflicting accounts cloud the details Alexander pointedly summed up the tragedy by writing “On the Texas/Mexican border rookies were but the raw meat of the devil”. Another example emerged with the death of Ranger Robert E. Doaty some two years later. Doaty had been a Ranger for only twenty-two days when he met death in another border shoot out. The same is true for Eugene B. Hulen killed in Presidio County in 1915 after being a Ranger forfifty-seven days. Although the author’s wordy writing style might burden some, Alexander does offer the dedicated reader an insight infrequently found in the innumerable volumes of Texas Ranger history. The author avoids the Texas Ranger mythology pitfalls of Walter Prescott Webb and others painting a realistic and sometimes gritty picture of these lawmen as they met their end. There are no stereotypes present in these stories. In a lengthy two-part introduction Alexander lays out his premise in which he acknowledges the wrongs and abuses of some pre-modern era Rangers. He traces the evolution of the Texas Rangers from their early days as Indian and bandit fighters and gunmen to today’s lawmen through advancements in transportation, tactics and technology. While Alexander promises, “no white washing” in his effort he does somewhat subjectively present the lawman’s point of view relegating divergent analysis to being somehow less than creditable. While Alexander seems to disdain the work of agenda driven scholars and those he considers to be “armchair historians”, he does not hesitate to make use of such research. No one doubts that law enforcement on the Texas-Mexican border is and always has been a very risky but necessary profession. It is also controversial mostly during the bloody years of the Mexican Revolution. This book will probably appeal more to Texas Ranger enthusiasts and less to those persuaded by revisionist views. However, it is an insightful work deserving consideration by all. These Rangers who gave their lives certainly merit inclusion in the pages of history. How and why they died is a worthy topic for reflection. Alexander’s effort is to be commended. As Louis R. Sadler put it “This is Bob’s best book to date” and it is. "Riding	Lucifer’s Line: Ranger Deaths Along the Texas-Mexican Border". By Bob Alexander. Denton: University of North Texas Press, 2013. Pp. xxvi, 404. Photographs. Notes. Bibliography. Index. $29.95 cloth. "The Americas: A Quarterly Review of Inter-American Cultural History"
Nick Kotz ‘ latest book “The Harness Maker’s Dream: Nathan Kallison and the Rise of South Texas” is a well-written and carefully researched piece of Texas history. Kotz tells the story of his uncle, Nathan Allison, born in the Ukrane, who left his native homeland and braved considerable odds to come to the United States in 1890. Living for a time in Chicago the young man married, started learning English and took up harness making. In 1899, Kallison moved his wife and family to San Antonio where he set up a one-room leather goods shop. The venture eventually grew into one of the largest farm and ranch supply businesses in the state. The Harness Makers Dream is not just a history of a sucessful businessman. 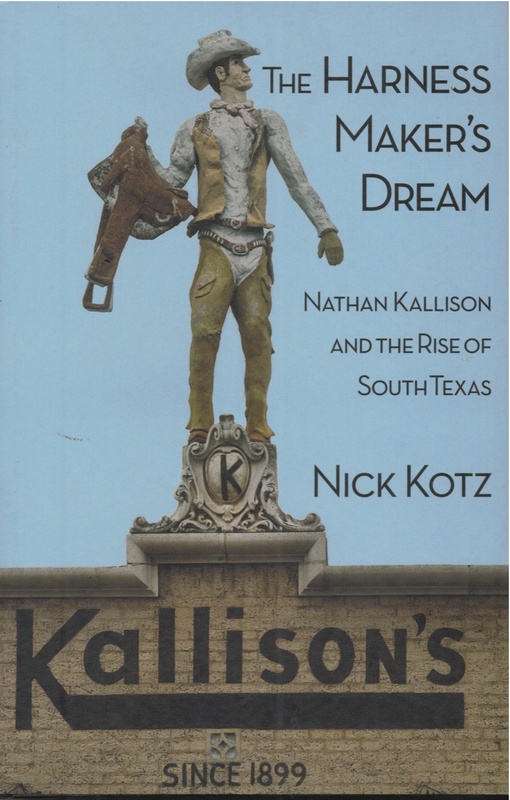 Nathan Allison was Jewish and Kotz’s book details the struggles of Jewish immigrants in Texas as well as their contributions to society and the economy. San Antonio born author Nick Kotz has penned a number of books and some years back won the Pulitzer Prize for his newspaper reporting. He is perhaps best known for a 2005 book: “Judgment Days: Lyndon Baines Johnson, Martin Luther King Jr., and the Laws That Changed America”. The Harness Maker’s dream is published by TCU Press, ISBN: 978-0-87565-567-3. According to Fort Davis historian Barry Scobee, Comanche Chief Quanah Parker showed up in Fort Davis in the last part of the nineteenth century. As Quanah put it, he came in search of “the gift-of-God cactus to lighten the Red man’s burden”. Accompanied by Chief Rising Star and several other dignitaries from the Indian Territory, Chief Quanah arrived at the Lempert Hotel much to the astonishment of a Miss Finck who presumably worked at the desk. Scobee described this most unusual occurrence. “Miss Finck heard a knock at the door and was somewhat startled to see three heap big Indians standing there in stately silence”. Mr. Fox, an Indian agent accompanying the party, stepped forward explaining that the chief and his two traveling companions came on a peaceful mission simply wishing to obtain bed and board while they searched for peyote somewhere in vicinity of Mitre Peak. Quanah apparently told the Indian agent that Comanche traditions taught the wonderful cactus could not be found in any other locality. While Scobee’s intriguing glimpse into the past ends there, there is more to the story, much more. Chief Quanah Parker likely knew the Texas Big Bend a lot better than most folks today might expect. Born about 1850 probably near Elk Creek near the Wichita Mountains of today’s Oklahoma, Quanah rose to become the principal Comanche leader during and after the Texas Panhandle Red River War. Quanah’s mother, a white woman of Scotch-Irish extraction taken captive at the age of nine years from Fort Parker, Texas in 1836 is Cynthia Ann Parker. Her story became immortalized in the dark but classic John Wayne movie The Searchers. 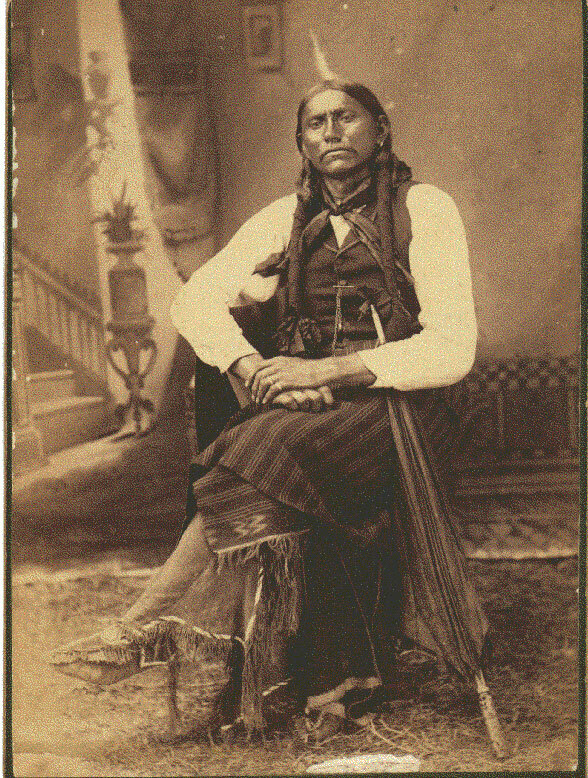 Quanah came from an impressive line of Comanche chieftains including his father, Peta Nocona, who Quanah said, died of complications from wounds received during a fight with the Apache. Iron Jacket, Quanah’s grandfather, got his name because he wore a Spanish coat of mail in battle. Comanche legend has it that Iron Jacket had the ability to blow threatening bullets away from him with his breath. Following the death of his father, Chief Wild Horse of the Destanyuka band took the ten year old Quanah Parker under his wing teaching the boy the warrior ways of the Comanche. It is not clear at what point the Comanche first used peyote in shamanistic ceremonies. According to anthropologist Dr. Omar C. Stewart who is considered to be an expert in the study of peyote use by Native Americans, the Comanche probably first learned about peyote during their raids to steal horses as they traveled on the Comanche trail across west Texas into Chihuahua. It is here that the young Quanah most likely first encountered the magical cactus. While Quanah Parker cannot be credited with introducing peyote to his people he became, according to Stewart, “the most important Comanche roadman in the early history of peyotism”. Long before the arrival of the Comanche, the Native Americans of Mexico including the Tarahumara knew of the power of peyote as a natural medicinal drug. Christian Tarahumaras also associated peyote with their faith. They also applied it to snake bites, wounds, and burns, and thought it cured cure rheumatism. But its power went beyond that. The Tarahumara believed if a man carried peyote on his person that bears could not bite them or deer run away, that game would become tame and easy to kill. During the early 1700’s Chihuahua experienced a considerable number of Spanish Inquisition investigations into the possession and use of Peyote. U. S. Army Captain Valery Havard, a surgeon stationed in the 1880’s near Presidio became one of the first Anglo physicians to describe the use of peyote and mescal beans in the Big Bend. He noted the beautiful flower produced by the peyote cactus and its presence in most Mexican houses. Although Havard said peyote is mostly an intoxicant he thought it to be good for the relief of fever. The good doctor also pointed out that if one chewed the magical cactus a “delirious exhilaration” could be experienced and that peyote in those days was known as “dry whiskey”. Quanna liked his peyote for more than one reason. In 1896 an observer saw him sit up all night during a peyote ceremony and eat thirty buttons. The following morning Quanna seemed unaffected and alert. He once sent a roadman to Mexico to obtain 8,000 buttons. Perhaps the chief summed it up best when he said, “The White man goes to his church and talks about Jesus. The Indian goes to his tipi and talks with Jesus.” Perhaps Quanah became a believer in the power of peyote when he went to visit his brother John Parker in Chihuahua about 1885. Previously he opposed the use of peyote. During the visit a Spanish bull is said to have somehow attacked the great chief leaving him with a terrible wound that resulted in a bad case of blood poisoning and fever. Other accounts state that Quanah only contracted some sort of stomach disorder. Whatever the case, a shaman mixed him a strong potion made from peyote juice and he recovered. Apparently Quanah believed the concoction cured him because after that time he became an ardent supporter of the use of peyote. As a whole, the Comanche and Quanah in particular never really had much confidence the Ghost Dance Movement of 1890. Quanah respected the white man’s religion but when told by the U. S. Secretary of the Interior that he must give up all of his wives except one and he had three, the great chief replied “Mr. Secretary you tell them”. Multiple wifes and peyote were two things Chief Quanah never compromised. He became a quite successful businessman making money in cattle and land. But even in his last days took an active part in peyote ceremonies described the Half Moon ceremony or the Quanah Parker Way. Quanah Parker died in 1911 but not long before his death C. S. Simmons observed the great chief conduct a peyote ceremony at his home outside Lawton, Oklahoma. “At about three o’clock in the morning, the silent hour and the time of the greatest manifestation of power, Quanah, the leader, knelt before the altar and prayed earnestly. Then, taking the eagle feathers in both hands, he arose to his feet. I saw at once he was under great inspiration. His whole personality seemed to change. His eyes glowed with a strong light and his body swayed to and fro, vibrating with some powerful emotion. Has sang the beautiful song “Ya-na-ah-away” in a most grand and inspiring manner. Then all sang together in harmony. They prayed to God and Jesus and sang of a “narrow way”. Note: Larry Francell tells me that when Quanah Parker came to Fort Davis the chief stayed at the Lempert Hotel not the Limpia Hotel. The present day Limpia Hotel was not constructed until 1912. In the 1880's an earlier Limpia Hotel did operate near the fort but this is not where Quanah stayed according to Larry. The old Lempert Hotel is today the Veranda Bed and Bed and Breakfast. Thanks for the info Larry! In 1897 Andrew Prude purchased three sections of land located not far from Fort Davis establishing the A. G. Prude Ranch. Soon he and his wife Ora moved into a small log cabin on their new property. In 1900 Andrew completed a wooden frame house for his family and in 1902 added 1257 acres to the ranch. In 1911 Andrew built a two story ranch house made of adobe bricks cast in a nearby stock tank. They called it the "Big House". By 1920 Prude expanded his ranch to some forty sections of land which comprised a considerable amount of Jeff Davis County. 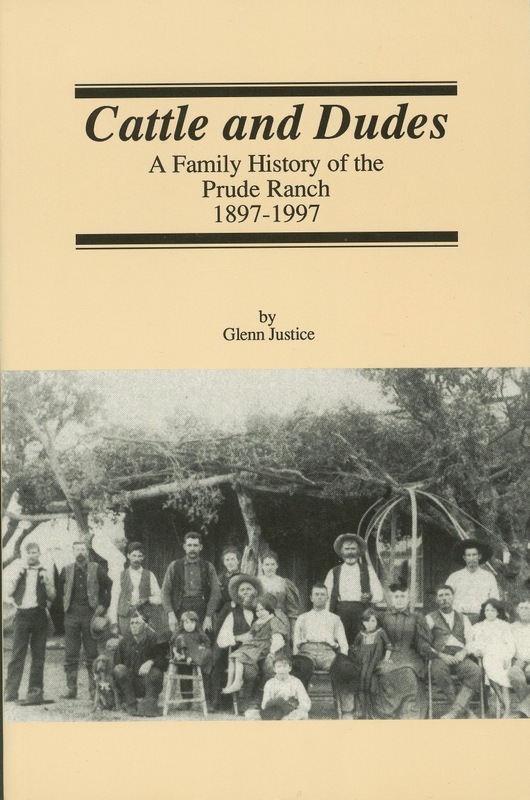 In 1921 the Prude Ranch started a guest ranch to share the beauty of the land and cool summer weather of the Davis Mountains with city dwellers from across Texas. Early guests arrived on the Southern Pacific Railroad at Alpine and made their way to the ranch by various means. When a terrible drought and the Great Depression of the 1930's forced Andrew Prude to sell his cattle and most of his land, the Prude family decided to operate the guest ranch full time. Soon a new highway near the ranch came into existence and more and more guests began to show up. New guest houses were built as well as a coaching school. The dude ranch program was expanded to include summer camps for boys and girls and various educational programs. The facilities have expanded over the years to accommodate a wide variety of activities. Prude ranch is well known across Texas as a popular tourist destination and continues into the second century of operation. How the ranch came into existence and continues to operate today after all these years is a fascinating story of determination and survival. Historian Glenn Justice used many primary sources and oral interviews to tell the story of this now famous Texas ranch. David Dorward arrived in Borden County in 1892. He was born December 15, 1872 in Burleson County Texas to David and Anna Dorward. In 1893 David began working as a wagon cook for the Square and Compass Ranch. A year later he went to work for the Magnolia Land and Cattle Company. 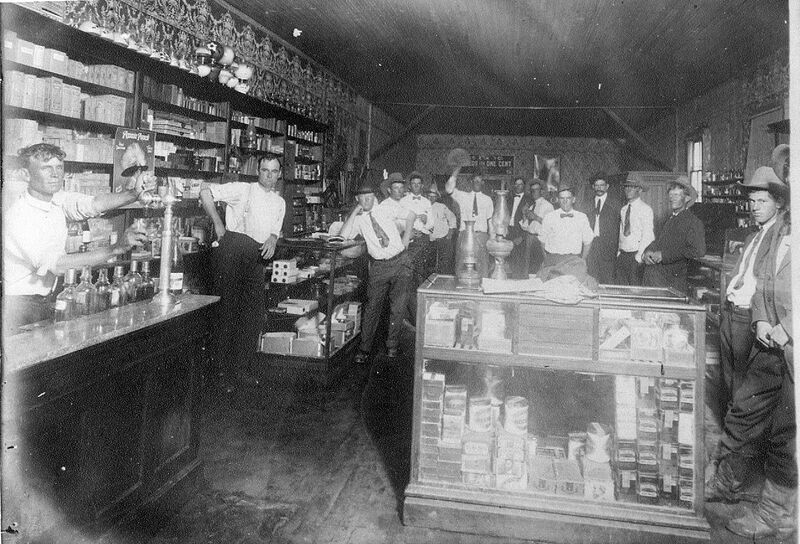 In 1901 David became a businessman when he opened the Dorward Drug on the courthouse square in Gail, Texas. Gail was a thriving community in the early 1900’s. A week after opening his drug store, he married Minnie Russell who taught school in Gail. To this union came three sons, Russell, Maurice and Kelvin. David did home study for his pharmacist license and had it issued by the Texas Board of Pharmacy on September 17, 1907. Doward supplied prescriptions for two local physicians, Dr. James Prince and Dr. John H. Hannabass. As the little town began to dwindle in population Doward”s Drug became the meeting place of the community by providing over the counter medicines, refreshments, and even ice for the old time iceboxes of the day. When the local telephone switchboard closed in 1918, Doward’s Drug had the only telephone serving Gail and the surrounding farms and ranches until the 1950’s. Telephone messages received by Mr. Dorward at the store would be delivered to local residents or to outlying farms and ranches. David Dorward also served by holding the offices of county treasurer and later served as Borden County Judge. David and Minnie became strong proponents of the Christian faith. David taught adult Sunday school classes for thirty years and Minnie taught classes for over fifty years. 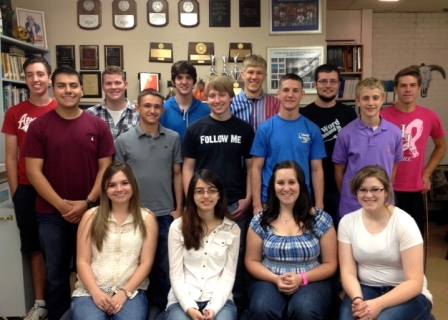 Their dedication left a legacy to the residents of Borden County. After their passing, the Doward Drug building went through many years of neglect until 2012 when R. D. “Buster” and Jean Creighton Taylor acquired the property. Much back breaking work ensued hauling away junk that had accumulated around the property. Jean and Buster were able to salvage the original walls, ceiling, shelving, soda machine and safe from eventual destruction. The pharmacy counter and samples of medicines and many other Dorward treasures may be viewed at the Borden County Museum. 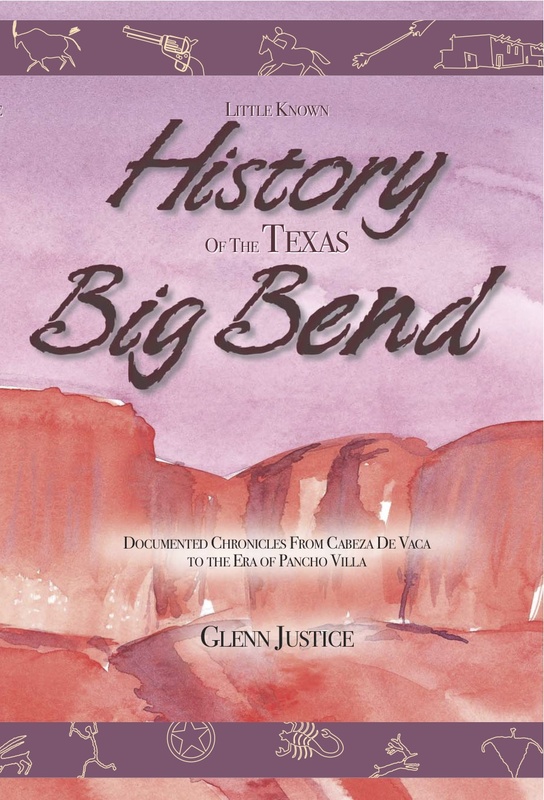 I am most pleased to announce my book "Little Known History Of The Texas Big Bend: Documented Chronicles From Cabeza De Vaca To The Era Of Pancho Villa" is now available in an E-Book edition at Amazon. Additional Amazon E-Book titles from Rimrock Press are coming soon!